The ruins were originally built by the ancient Nords during the Merethic Era as a temple to the dragons who ruled Skyrim at the time. It grew into the great city of Bromjunaar, and became the capital of Skyrim during the height of the Dragon Cult's power. The highest ranking Dragon Priests met there to discuss matters of ruling. The mask Konahrik was stored there, and it could only be accessed if all eight of the lesser masks of Skyrim were placed on their respective pedestals within its sanctuary. With the defeat of the Dragon Cult during the Dragon War, the city of Bromjunaar crumbled and was left abandoned and the shrines and temples fell into ruin. In the First Era, the Archmage Shalidor built the Labyrinth deep in the ruins of Bromjunaar. Some say Shalidor's Maze was built to hide Glamorill, or the "Secret of Life", which he supposedly stole from Akatosh. However, Shalidor began to use the labyrinth to test potential archmages. If they survived navigating the ruins and making it through the labyrinth, they passed. Eventually Labyrinthian, as it had come to be known as, ceased to be used, and the test is considered brutal by modern standards. The labyrinth is actually divided into two sections, both of which must be navigated to complete Shalidor's test. Several gates bar the path, and can only be opened by casting a spell from the specific school of magic. How to navigate the labyrinth is not common knowledge, as all the archmages who passed were very secretive. At some point after its abandonment, either before or after Shalidor built the Labyrinth, the ruins came under the jurisdiction of Jarl Gjalund of Whiterun. The settlement was still inhabited, but was greatly diminished in comparison to ancient times. It was a source of lumber and stone for the hold. Sometime after the total abandonment of Labyrinthian, two brothers—Kanen the Elder and Magrus the Dim—ventured into the maze in search of the Secret of Life, despite being warned against it. The brothers were ensnared by the riddles contained within the labyrinth, and their ghosts were made to guard the ruins. Magrus guarded the diamond key, and Kanen guarded the sapphire key. Both keys were needed to get to the center of the maze. The ruins were discovered after Jagar Tharn hid a piece of the Staff of Chaos within Labyrinthian during the Imperial Simulacrum. The Eternal Champion recovered the piece and freed the brothers' spirits. Following his death, the Eternal Champion became somewhat of a culture hero to Imperial Loyalists, many of whom visit the ruins as part of a pilgrimage retracing the Champion's steps. Sometime after 3E 427, the Staff of Magnus came into the possession of Morokei, an undead Dragon Priest who dwelt deep within the ruins of Labyrinthian, who was also the bearer of one of the magical Dragon Priest Masks (also named Morokei). A group of students from the College of Winterhold, led by Savos Aren, discovered this and attempted to retrieve the staff. The group was no match for the denizens of Labyrinthian, and only Aren escaped alive, having to sacrifice two of his peers to contain Morokei. Aren sealed the ruins to prevent anyone from freeing Morokei from his imprisonment. 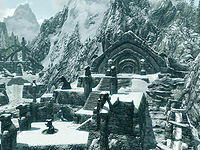 In 4E 201, the Eye of Magnus was discovered in Saarthal and brought to the College. Ancano, a Thalmor representative, attempted to seize control of the Eye and killed Aren (who, by then, had become Arch Mage of the College) in the process. The Last Dragonborn of the College was sent to Labyrinthian to search for the Staff of Magnus, and opened the seal placed by Aren years previous. The Dragonborn defeated Morokei and claimed both his mask and the Staff of Magnus, which was later used to stabilize the Eye. The barrow containing Konahrik had long since fallen into ruin, and the eight lesser masks scattered throughout Skyrim, buried with their respective owners. A scholar discovered a ceremonial wooden mask similar to the lesser masks. When worn in the dilapidated sanctuary, it would transport the wearer back in time, to before the city was abandoned. Unfortunately, the mercenaries he had hired for protection murdered and robbed the scholar, leaving his corpse and the wooden mask, which they believed worthless, behind. In 4E 201, the Last Dragonborn discovered his remains. After confronting and defeating eight highest ranking Dragon Priests, the Last Dragonborn was able to collect all eight of the lesser masks and was able to travel back in time and place the masks upon their respective pedestals, retrieving Konahrik and bringing it to the present. ^ Urag gro-Shub's lecture in Skyrim.